Laboratory of Mechaniacal Properties and Fracture. Photo: CONICET Photography. Ankle supports, helmets, suitcases or cling film. It is not only important the resistance of the material, but also its lightness, and its capacity to be transported or storable. Each material has its specific physicochemical properties, its variants and particular structure. The study of these properties is known as the characterization of materials. From basic research and engineering knowledge, it is fundamental to make objects and structures of everyday life as resistant as possible. Furthermore, they should contain the less number of components that affect the environment, and be able to be produced at a lower cost. Some examples in this regard are the self-reinforced compounds that Celina Bernal, principal researcher at the Institute of Polymers and Nanotechnology (ITPN, CONICET-UBA) and her work team study the enhancement of the materials that can replace others which are used in various applications. With Mariana Mollo, who works at the INTI Plastics Centre, and Valeria Pettarin, independent researcher at Institute for Research in Materials Science and Technology (INTEMA, CONICET-UNMDP), Celina Bernal studies these compounds in which both the matrix and the support share the same chemical nature. They use, for instance, polypropylene with fabric or fibres of the same substance; or polyethylenterephthalat, which is found in disposable bottles. “The idea is to have a material completely recyclable through fusion. The problem of this traditional components, for instance in the case of the polypropylene with glass fibre, is that it is necessary to separate the glass fibre from the matrix to recycle the material”, Bernal explains. In car or transport industry, to have a lighter material without affecting its resistance means to consume less fuel. “There is a double benefit for the environment because lighter vehicles will consume less and will be recycled”, Bernal describes. Currently, there are several brands in the market that use this materials’ technology but they are developed abroad, so for this reason the scale used at the ITPN laboratory could be transferred to the great national industry, according to the needs of the companies. This is one of the main objectives of the institute since its in creation in 2013: to collaborate in the innovation of plastics’ sector companies. “For instance, two dissertations presented at the University of Buenos Aires appeared as a result of an enquiry made by an industry that produces nonwoven polypropylene fabric, such as the one used in diapers or surgical masks. They needed to reuse the materials, the waste or cut-outs”, the engineer comments and adds: “In our country, there is a long way to go, and we have to make companies invest in development at university. So far, they are interested in STAN [High Level Technical Service], but only some, like YPF Technología, invest in the development stage. 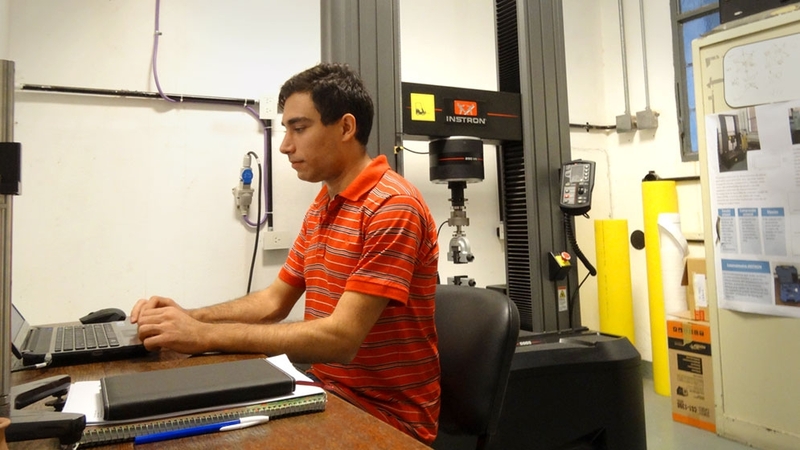 For structural calculations and innovations in plastic industry, it is important the work of the engineers, chemists and technicians to monitor the damage in the materials and anticipate structural failures or the wear of one piece. Several companies use technical services of the university for these measures with tests and descriptions. “We have worked with companies that provide materials for aerospace industry through quality control and materials testing for suppliers that work with those firms. Furthermore, we collaborated with companies that produce biomedical implants on various tests that can be classified into, for example, the “Food and Drugs Administration”, the scientists describes.